Sylvan Barnet, is a former Fletcher Professor of English Emeritus and director of writing at Tufts University. Barnet is the author of numerous books and articles on Shakespeare. He was the general editor of the Signet Classics Shakespeare, the author of A Short Guide for Writing about Art, and has written many textbooks about literature and drama. He is the co-author with William Burto of occasional essays on aspects of Japanese art. He has also written books about the art of writing. William Burto is a former Professor of English at the University of Massachusetts, where he served as chair of the Department of English. 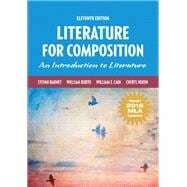 Burto is the co-author of several highly successful college textbooks on literature, drama, and composition. He was also the editor of the Signet Classic Edition of Shakespeare's sonnets and of Shakespeare's narrative poems. William E. Cain is Mary Jewett Gaiser Professor of English at Wellesley College. Among his many publications is a monograph on American literary and cultural criticism, 1900-1945, in The Cambridge History of American Literature, vol. 5 (2003). He is a co-editor of the Norton Anthology of Literary Theory and Criticism (2nd ed., 2010), and, with Sylvan Barnet, he co-authored a wide variety of books on literature and composition. His recent publications include essays on Ralph Ellison, Ernest Hemingway, George Orwell, Shakespeare, Edith Wharton, and Willa Cather. Cheryl Nixon is an Associate Professor of English and Chair of the English Department at UMass-Boston. In addition to her undergraduate courses, she teaches graduate Teaching of Literature courses and works with a staff of teaching interns to design and deliver general-education literature courses. Her courses feature project-based assignments and she often uses out-of-classroom learning to spark curiosity about literature. For example, she has worked with students to create rare books exhibitions for the Boston Public Library, including “Crooks, Rogues, and Maids Less than Virtuous: Books in the Streets of 18th-Century London.” Her research focuses on literary and legal representations of the family, and her recent works include The Orphan in Eighteenth-Century Law and Literature: Estate, Blood, and Body and Novel Definitions: An Anthology of Commentary on the Novel, 1688-1815.